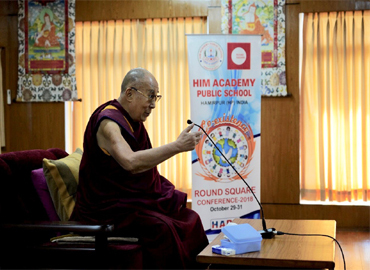 At the HIM Academy RS Conference His Holiness, The Dalia Lama, spoke to all RS schools. “Wherever we live and whatever our nationality may be, this planet is our home. In the past, isolated communities could afford to think of one another as fundamentally separate. Some could even could exist in total isolation. Today, with advancement in science and technology the world has become heavily interdependent. What happens in one region could affect many other areas, which demonstrates the oneness of humanity. Therefore, mutual co-operation and consideration are essential, as without them, the well-being of all is threatened. Our great human family of around seven billion people has adherents of various beliefs, traditions and educational backgrounds, there are differences in our values and approaches to addressing our needs; however, at our core we all yearn to be happy. Our pursuit of happiness should also include the well-beings of others. The concern we demonstrate for their well-being reflects the beauty of our mind. Qualities such as wisdom, courage, determination, satisfaction and calmness are all aspects of a compassionate mind. People sometimes misunderstand the effect of cultivating compassion, thinking that only others benefit from it. This is a mistake. The practice of compassion is a direct source of peace and joy for ourselves and others. It is my hope, therefore, that the young people who have come to take part in this conference will think and discuss how they too, wherever they are, can respond to others with compassion, which has the potential to make the world a better place for all of us. I firmly believe the 21st century can become a period of peace and dialogue and today’s youth have both a special responsibility and the opportunity to make this happen."